almost immediately. 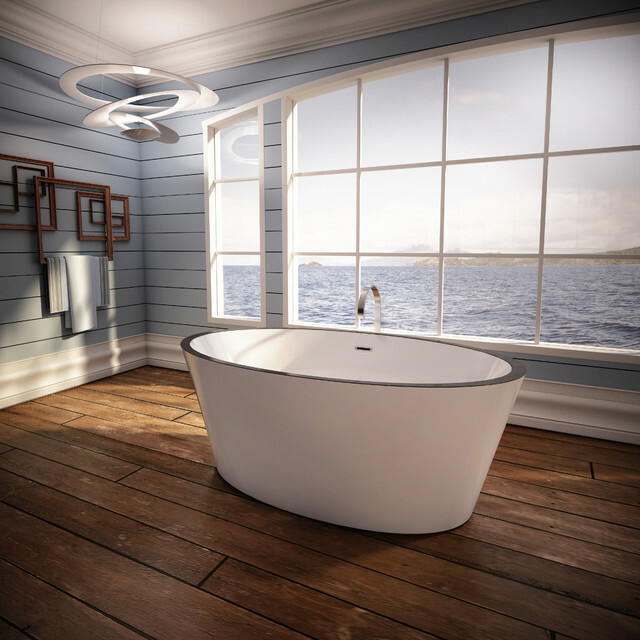 All Bain Ultra tubs provide between 45-90 individual air jets that are located to be at the perfect position for the best in relaxation. And since the water stays in the tub and only hot air is circulated, there is none of the problems associated with conventional jetted tubs and you can use bath oils for even a more therapeutic experience. Many Bain Ultra tubs come with heated and air jetted backrests and recessed bottoms with air jets to reach and sooth the spine, neck and back of the leg and lower back area. That is why top spas and resorts have used Bain Ultra for years. For 2015, they have introduced the Charism model. This freestanding model is available in both oval and rectangular and is simply a stunning work of art that deserves to be the focal point of any master bath design. The optional slate or copper contrast banding at the top rim adds yet another design element that gives the tub great style. Come see our line of Bain Ultra Thermomasseur tubs and let us demonstrate to you why they set a new standard in bathing and relaxing. Visit us on the web at Haskellinteriors.com or stop by our showroom located in historic downtown Cleveland, TN we offer you the largest selection of tile, plumbing, cabinetry, hardware, furniture, fabric, wallcovering and accessories in the Chattanooga area.